Home Page of the author It's been fairly quiet on the local news scene this week, with few of the usual upbeat stories concerning new developments in Manchester. But life goes on as normal, as can be seen in this week's pictures, mostly taken today. Last Wednesday was judgement day for Frank Clark, former Manchester City boss, who heard of his sacking on the BBC local radio station, GMR. Joe Royle takes over as the new manager. Manchester City are at the bottom of Division 1 and may be relegated. I went to the city ground that morning to find the media representatives and a small crowd waiting outside the ground. 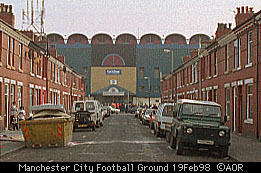 One group of fans had draped a Ford Sierra estate with a sign saying: "Manchester City fans wish to protest at the appalling display of so-called football by the current squad. As paying customers we demand that Francis Lee + Frank Clark resign forthwith". Well, they got what they wanted, both were gone by the end of the morning. The 1998 Mardi Gras festival has been cancelled, at least that's what was being said this afternoon. The required amount, reported variously as �,000 or �,000, hasn't been raised. Businesses in the Canal Street Village area are encouraged to donate money towards the festival, but it appears that some haven't responded to the appeal. Last summer's festival (see Eyewitness in Manchester, Newsletter 1997, week 34) drew thousands of people and was a big success. The case of the Bolton homosexuals convicted last week under indecency laws has been attracting national attention. A group of men, the youngest 17 and the oldest in his fifties, recorded themselves on video indulging in sexual activities. The videos were found and seized by the police, and the men were tried, found guilty and given suspended sentences. Veteran gay rights campaigner Peter Tatchell came up from London to take part in the campaign. A revolutionary new solar powered ticket machine will go into action outside the visitors centre at Hollingworth Lake Country Park. The machine has a solar panel which charges up a battery, so it doesn't have to be connected to the electricity supply. They're already widely used on the continent - I've seen them in Berlin and Holland - and I understand they even work when it's grey and drizzly, which people say is typical Manchester weather (not true). Parking is big business: You can't leave your vehicle anywhere in the city nowadays without paying for it - a city centre car park will cost you roughly a pound an hour - more if it's centrally located, less if it's further away, or a multi-storey. 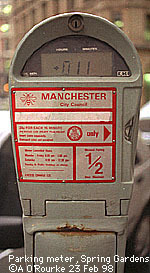 Parking meters range from 20p for half an hour, maximum stay three hours, to 20p for 15 minutes, maximum stay two hours, and 20p for half an hour, maximum stay half an hour, as can be seen on this one off King St, next to the Midland Bank. The parents of the three children killed in the coach accident in France last year (Robert Boardman 14, Nicola Moore 15 and Keith Ridding 14) have expressed their anger that the coach in which they died had no seatbelts. As the school headmaster told the media, the school's policy is for children on buses to wear seatbelts at all times. Unfortunately, the British-registered coach hired by the school was substituted in France for a smaller one without seatbelts. At the inquest in Bolton into the incident, a verdict of accidental death was returned. Driver Jim Shaw was convicted of involuntary manslaughter by the French court. Last Tuesday, the "Kwik Save" murderer Richard Allen, 32, from Chorlton, weas sentenced to life for the murder of David Beesley, 28 at the Kwik Save supermarket in West Didsbury three years ago. Allen denies murder. And 31 year old ex-model Lorna Dow of Burnage, was jailed for three months, with 6 weeks suspended, for assault and bodily harm during a flight to New York. Thoughts of foreign travel and exotic holidays are in the air - my most exciting journey recently was a train ride to Manchester Airport to take some photos. But more far-flung locations were on offer at the Independent Travellers World show at GMEX, which I attended over the weekend. I heard a talk on the "Sea to Sea" bicycle route from Cumbria to the North East coast - an interesting, scenic and totally different holiday option only two hours away from Manchester. That's it from Eyewitness in Manchester this week, apart from to tell you that yesterday's blue skies and billowing clouds turned to grey skies and drizzle today. Most of last week was very pleasant, with temperatures above the seasonal average. The photo above was taken on Friday, which felt like a carefree spring day. The one below was taken this morning. If you're looking for self-catering holiday accommodation near Manchester, have a look at the Coachhouse. Please help, I have searched the net all night looking for the email addresses of the "Manchester Evening News / Ashton Reporter" newspapers. As you can see from the attached transmissions I am looking for information re: people from the Ashton Under Lyne area, I would be grateful if you could either pass this information on to the above publications or email me back with their email addresses. ps: I have only just got on to the WEB and enjoyed photos and articles on your web pages. I decided at last to write and thank you for this wonderful site as some of the news and pictures are a definite part of my past. 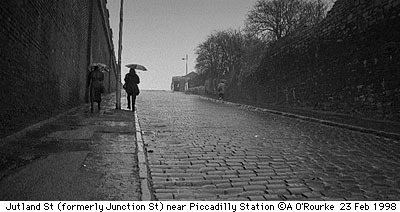 When I first went to Grammar School, Notre Dame High School for girls, in 1965 I took the train from Flixton to Central station. I don't remember exactly when we went to diesel but that first year it was pulled along with a steam engine. 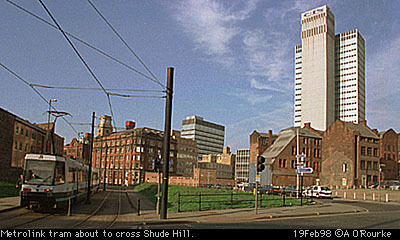 When Central station closed down we used Oxford Road Station. This week you have the news piece on the Free Trade Hall. 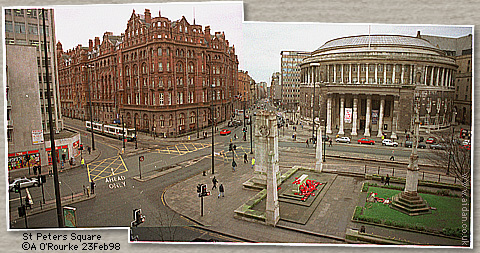 Every September Notre Dame, along with several other schools I'm sure, had 'Speech Day' at the Free Trade Hall. I can even say that I performed on that stage. Of course I was just another girl singing in the school choir but I felt important. After I left school I even got to return and walk across the stage to pick up my 'O' level certificate. No other awards before that I'm afraid. I know that Notre Dame was renamed several years ago but do the buildings still exist? I think it was on Hayward St. It would be great to see some pictures. When I left Notre Dame my first job was at the Refuge Insurance Co. You have a picture of that building available at this site. My parents still live in the same house that they bought back in 1957 on Western Road in Flixton. I managed to find an old picture of Western Road on Urmston market when I was there in 1996. I'm not sure if the Notre Dame buildings are still standing. Does anyone know? Thanks for your kind comments, and please keep reading Eyewitness in Manchester.